Background Price-based mechanisms are an important tobacco cessation policy tool in New Zealand (NZ) and so measurement of smokers’ reaction to price changes is crucial in determining efficacy of this approach. Although approximately two-thirds of NZ tobacco demand is for manufactured cigarettes (MC) and one-third is for Roll-Your-Own (RYO) tobacco, previous price elasticity estimates have ignored differences between RYO tobacco and MC consumers. Methods We employ a seemingly unrelated regression econometric approach applied to quarterly data over the period 1991–2011 to estimate price elasticities of demand separately for MC and RYO tobacco. Results Estimate of price elasticity of demand for MC is −1.033, and −0.441 for RYO tobacco. RYO tobacco is an inferior good; a 1% increase in average weekly income is associated with a 0.8% reduction in demand. RYO tobacco is a substitute for MC; a 1% increase in the price of MC is associated with a 0.867% increase in demand for RYO tobacco. Conclusions There is significantly different price responsiveness across the two tobacco product types. MC smokers react far more strongly to price increases compared with RYO tobacco smokers. These findings suggest that pricing mechanisms may be more effective for reducing MC demand than for RYO tobacco. However, substitution between products means that this pricing effect is muted by the uptake of RYO tobacco use. Cessation policy specific to RYO use should be designed to target this growing group. Smoking tobacco remains New Zealand's (NZ's) single biggest cause of preventable morbidity and mortality. Over one-fifth of the adult population regularly smoke and it is estimated that half of them will die from a smoking-related illness. Smoking cessation actions have made significant gains in reducing prevalence and total consumption based on a diverse suite of policy initiatives. Smokers trying to quit can benefit from a wide range of support aimed at increasing the chance of successful cessation such as nicotine therapy and QuitLine phone support. Other demand side policy includes warnings on packaging, sale age restrictions, advertising prohibition and sale price. In NZ, there are two main types of tobacco products consumed, Roll-Your-Own (RYO) tobacco and manufactured cigarettes (MC). Although other products are available such as pipe tobacco, they constitute an insignificantly small proportion of total demand. While overall smoking prevalence has fallen from around 27% in 1990 to about 21% currently,1 ,2 the prevalence of smokers using RYO has increased dramatically from about 16% in 19903 to approximately 38% presently using RYO exclusively and 53% regularly.4 ,5 This represents a high level of RYO use internationally; however, other countries are also experiencing increases in RYO prevalence such as Germany6 the USA and the UK where prevalence is estimated to be about 38%.7 RYO use in NZ is predominantly associated with low socioeconomic status8 with the most common reason given by users for preferring RYO tobacco is lower cost.4 ,5 Both of these main characteristics are consistent with international studies.7 The role of RYO as a substitute for MC has received limited econometric attention internationally. Substitution effects have been confirmed for Finland9 ,10 and Germany6 but not found for Ireland.11 Overall these studies suggest the possibility of a positive relationship between the price of MC and the quantity demanded of RYO tobacco. This article analyses whether in NZ RYO tobacco is a substitute for MC and provides estimates of own price elasticities for RYO and MC. Price-based policy mechanisms based on increasing tax rates have a strong foothold in the NZ tobacco cessation framework aimed at achieving a smoke-free NZ by 202512 . There is a substantial international literature focused on taxes applied to tobacco markets.13 ,14 Although not formally tobacco taxes, Customs and Excise taxes on imported tobacco products have been supported as a public health policy in NZ.15 ,16 This policy currently operates successfully as no commercial tobacco is grown domestically and so all tobacco is taxed at the border. MC and RYO tobacco taxes in NZ were last equalised in 1995. Since that time, changes in the amount of tobacco contained in MC have resulted in RYO tobacco becoming about 14% cheaper. While total tobacco demand has continued to decrease, this price differential has been argued to cause observed increases in RYO tobacco demand. Recent public policy has seen this price differential eliminated by equalising Excise and Duty tax rates across both tobacco products. Beyond tax equalisation, Ministry of Health and Treasury preferred tobacco tax policy is for a systematic series of significant increases to all tobacco prices.17 ,18 The underlying assumption is that as the prices of tobacco products increase, there will be a significant reduction in demand for tobacco. Estimation of the magnitude of tobacco consumers’ reaction to increases in price is therefore crucial to understanding the efficacy of such policy mechanisms. All previous NZ studies have combined RYO tobacco and MC into a single dependent quantity variable for demand estimation. This approach follows the majority of international studies; however, there are several international studies providing estimates for RYO and MC separately, including for India,27 Finland,9 ,10 Holland,10 Ireland11 and Thailand.28 Given the recent revival of tax increases and legislative amendments in NZ, this article is timely in re-examining consumers’ price responsiveness with the aim to provide a contemporary estimate that differentiates between RYO tobacco and MC. This study has two main objectives. The first is to estimate price elasticity of demand for RYO tobacco consumers and for MC consumers separately, and the second objective is to examine the role of RYO as a substitute for MC. This study contributes to the tobacco modelling literature both domestically and internationally. In NZ, price elasticity has not previously been estimated for these two groups individually. This new information can aid in informing price-based tobacco cessation policies likely outcomes directly. As well as supplying practical metrics to tobacco modellers in this area facilitating increased analytical depth and discussion of tobacco consumer behaviour across researchers. Internationally, this study provides an example of seemingly unrelated regression (SUR) econometric modelling that adds to a scant body of literature employing this approach. Econometric models were used to estimate the response of consumers of RYO tobacco and MC to changes in own real price. Modelling frameworks employed in the literature to estimate the demand for tobacco have centred on the rational addiction model29 ,30 and the habit persistence model also known as the myopic-rational addiction model.25 ,26 ,31 The habit persistence assumption involves backward-looking behaviour only, while the rational addiction assumption also examines forward-looking behaviour implying that anticipated future prices have an effect on current consumption. We conducted a modelling procedure investigating the two general demand structures described above and find no support for inclusion of future prices or consumption, nor past consumption in demand equations for either RYO or MC products. Therefore, we present estimates from a static-based model structure that is also employed in the literature10 that does not include past consumption or future prices. In contrast to previous NZ studies, we specify a model that is disaggregated by demand for RYO tobacco and demand for MC as shown in equations 1 and 2. This allows us to estimate price elasticity of demand for each of the two tobacco products individually. This specification assumes that the non-price policy variable has the same effect of both product types, while changes in income may affect demand for each product separately. By employing a SUR approach, we jointly estimate the demand equations for each product. Joint estimation of the equations exploits additional information inherent in the correlation between unobserved factors that affect both the dependent variables. The main advantage of the SUR specification is its treatment of the correlation across observations at a particular point in time in that estimators in the SUR model minimise the determinant of the covariance matrix of the system disturbances.32 Estimating each equation independently using an ordinary least squares (OLS) estimator would be consistent but not efficient if we believe that there is a relationship between the unobserved elements of each equation. Although the vast majority of econometric studies of tobacco demand use single equation OLS approaches,19 examples of SUR applications can be readily found.33 ,34 We directly estimate this model in double-log form using feasible generalised least squares.35 This means that the data are in natural logs, while the parameters are linear. This specification has the advantage of the coefficients on prices, β2 and β7, being directly interpretable as the short-run price elasticities of demand. All model data are for the 1991–2011 period. The quantities of RYO loose tobacco and of MC are monthly tonnes of tobacco and number of cigarettes released for sale, respectively. Because these quantities are duty paid volumes, there may be some limitation in their ability to reflect actual consumption. Other sources of tobacco consumed are illicit trade and legally grown tobacco for personal use. The extent of illicit trade in NZ has been estimated to be between 0.8% and 2% of total consumption.36 What is much less clear is the amount grown for personal use. Up to 15 kg may be grown annually for personal use; as long as none is sold, it attracts no tax. Tobacco tonnage is converted to cigarette equivalents using a conversion factor of 0.7 g per cigarette. Both series are divided by the 15+ population37 and monthly observations are summed to form quarterly series to align with quarterly price indices for MC and RYO loose tobacco. Income is quarterly averages of full-time-equivalent weekly income before tax. The quantity data series are extended from the second quarter of 2010 to the end of 2011 using 2010 and 2011 annual quantities released for sale distributed quarterly according to average distributions observed over entire series. In both the RYO and MC quantity series, we observe an increase in quantities released for sale in the fourth quarter associated with the Christmas period, and a decrease in sales in the first quarter following the Christmas period. This cyclical pattern is observed throughout each series and these seasonal movements can obscure other characteristics of the data that are of interest, therefore seasonal adjustment is applied using the EViews Census X12 program.38 This approach to treating seasonal data is relatively common in agricultural economics and examples can also be found in the tobacco modelling literature, see for example.6 In an attempt to control for smoking cessation policy other than tax based, the model includes a tobacco control scale variable. The scale increases over time as more policies are added. The following events are combined, each given equal weight: the Smoke-free Environments Act (1990) that placed controls on marketing, required health messages on packaging and made smoke-free places, establishment of Quitline (1999) a publicly funded charitable trust helping smokers quit by providing subsidised nicotine patches, engagement with health professionals, assisting employers to reduce smoking in the workplace and advertising in various public media, the Smoke-free Amendments Act (2003) that widened the range of smoke-free places to include bars, restaurants, enclosed workplaces and schools, larger text and picture-based health warnings on packaging (2007) and the Smoke-free Environments Amendment Act (2011) that banned display of tobacco products in retail premises. This approach has been applied in the literature10 ,11 and was favoured here over dummy variable specifications that poorly effected overall model performance. Visual inspection of series graphs indicates trends in some series suggesting that some may be non-stationary or trend stationary. The main concern is spurious regression, where two independent series appear to be related because they are driven by a similar trend, but in actuality there may not be any meaningful relationship between them. If the variables in the regression model are not stationary, then the usual assumptions for valid analysis will not hold. To investigate this possibility, we conduct a series of unit-root tests: Augmented Dickey–Fuller (ADF),39 Phillips–Perron (PP)40 and Kwiatkowski, Phillips, Schmidt and Shin (KPSS).41 The results are presented in table 1. Tests revealed evidence of stationarity consistently over the three testing procedures for both the quantity and the real price index of MC. While for the quantity of loose tobacco, the ADF and PP support series stationarity and the KPSS test rejects the null of stationarity only at the broadest level. The results for the real price index for loose tobacco and for average weekly income are less clear with the PP test finding some evidence of stationarity, while the ADF fails to reject a unit root and the KPSS test rejects stationarity at a 5% level. These results indicate that we can rely on the standard statistical assumptions for the following econometric modelling; chiefly this means that the usual t-ratios will follow the t-distribution. Given the concerns of possible unit roots in the real price index for loose tobacco and in average weekly income, we tested the system residuals for a unit root. Using the three tests as above, we consistently found strong evidence that the residuals are stationary. We also found evidence that the residuals are multivariate normally distributed (p=0.057) and absent of serial correlation up to eight lags (p=0.084). Looking at coefficient estimates in table 2 reveals several interesting findings. Demand for RYO tobacco is considerably less elastic than demand for MC. A 1% increase in the price of RYO tobacco is associated with a 0.441% reduction in RYO demand, while the same level of price increase for MC leads to a reduction of 1.033%. A Wald (1943) test42 rejects the null hypothesis of equality, confirming that these two groups of smokers react differently to price changes. An increase in average weekly income of 1% is associated with a reduction in demand for RYO tobacco of 0.867%. This indicates that RYO tobacco is an inferior good, the consumption of which decreases as income increases and vice versa. The coefficient on the price of MC in the RYO demand equation is positive and significant indicating that RYO tobacco is a substitute for MC. A 1% increase in the price of MC leads to a 0.87% increase in demand for RYO tobacco. Although the non-price policy variable is negative, it is highly insignificant. This study employed an SUR modelling approach with 20 years of quarterly data on RYO tobacco and MC consumption in NZ estimating price elasticity of demand for each of these tobacco products. Of significant relevance to informing price-based policy mechanisms, the study finds that there is significantly different price responsiveness across the two product types. Estimate of price elasticity of demand for MC over the 1991–2011 period is −1.013 and −0.441 for RYO tobacco. The discovery that demand for RYO tobacco in NZ is less elastic than demand for MC is consistent with studies of the Netherlands, −0.551 for RYO versus −0.635.10 But is contrary to studies of Ireland, RYO=−1.013 versus −0.95811 and Finland, RYO=−0.426 versus −0.413,10 although the magnitude of difference between estimates for either of these countries tobacco products is relatively small compared with NZ. All three of these international comparators have a far lower level of RYO use relative to NZ, which may play a role in explaining observed differences. International evidence indicates that income elasticities are generally found to be positive for MC and negative for RYO tobacco,10 and this is consistent with the results of this article. Increases in income levels are associated with less consumption of RYO tobacco. The income elasticity for RYO tobacco estimated here is somewhat less than that estimated for Finland (−1.257) and slightly more than that of the Netherlands (−0.69).10 These results are what we might expect from the descriptions of likely RYO users. International evidence suggests that RYO users are generally younger, less educated and have lower incomes7 and this is evident in NZ also.4 ,5 ,8 With this in mind, we might have expected to see stronger price responsiveness from these smokers compared with their MC counterparts. An explanation that is supported in the NZ context is the ability for RYO users to mute price effects by modifying their smoking behaviour. This can take the form of rolling smaller, tighter cigarettes to reduce the cost per cigarette relative to MC4 ,43 while smoking more intensively by inhaling more smoke per cigarette, taking more puffs and puffing longer.43 This behaviour would have the effect of reducing costs while maintaining levels of smoking satisfaction. 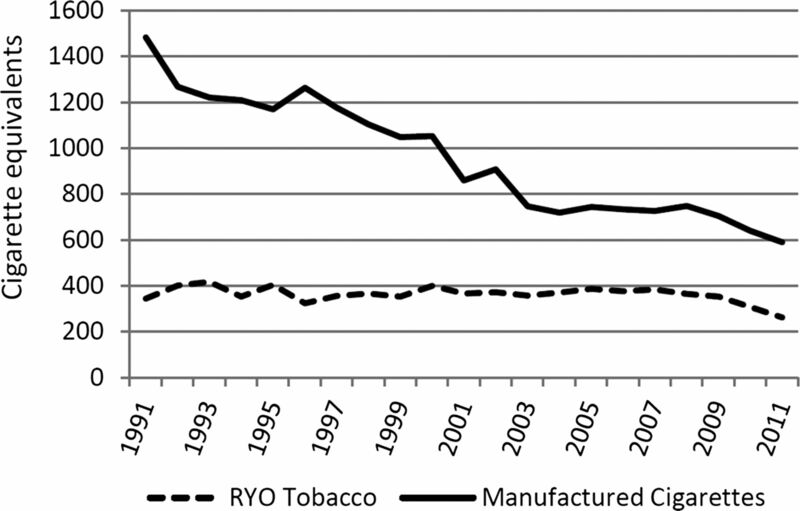 Looking at figure 1 shows that while MC consumption has been declining steadily, the consumption of RYO tobacco has not reduced as significantly. Indeed the proportion of RYO tobacco of total consumption has increased dramatically over the past two decades. This reflects the observation that overall smoking prevalence has fallen, while RYO prevalence has increased suggesting that some smokers may be substituting RYO tobacco for MC. This article supports this argument of RYO as a substitute by providing the first estimate of cross-price elasticity for NZ. The 0.867 estimate is about half of that estimated for Finland (1.733);10 retail price differences between RYO and MC are larger in Finland than in NZ, which may partially explain this stronger substitution effect. Consumption (per capita 15+) of Roll-Your-Own (RYO) and manufactured cigarettes (MC) in New Zealand (1 MC=0.7 g of RYO tobacco). The results of this study, when combined with what we already know, have possible implications for tobacco cessation policy in NZ. Despite the fact that there is a price response by RYO users, this driver is offset by MC user substitution and behavioural adaptation by RYO users. The result is a subduing of tax-based policy effectiveness in the market for RYO tobacco. To counterbalance these factors requires a policy response specific to the RYO market. This may include a differential tax scheme weighted against RYO tobacco, although such a policy may have adverse consequences. These unwanted outcomes could include inducing substitution in the opposite direction, towards MC use, and exacerbating financial hardship within RYO users, especially given the higher deprivation levels for this group and evidence that RYO users are more addicted than MC users.44 An alternative approach would target cessation policy more directly towards RYO users by creating programmes specific to this group rather than to smokers generally. A starting point would be to detect policy setting inconsistencies that may be distorting the tobacco market towards favouring RYO use. The lack of health warnings on filters and rolling papers that are both required for RYO use may fall into this category. Moreover, filters and rolling papers are not subject to the retail display restrictions as are tobacco products. The role these consumption complements have in influencing RYO behaviour in NZ is unclear and may be important. There is some evidence that RYO users believe that RYO use is less harmful than MC use43 and having RYO-associated products fall outside current legislation may contribute to such views. Other policy specific to RYO use requires more in-depth research to understand with greater detail than presently, the nuances of RYO smoking that set it apart from MC use. There is an emergent understanding of the unique culture of the RYO tobacco market that creates a ‘ritual’ value to users5 that differs from MC use. Policy development must engage with this understanding of ritualised behaviour and develop understanding to encompass cross-over with younger smokers. This development is crucial given that 63% of 18–24-year-old smokers in NZ are using RYO tobacco. If this group can be dissuaded from continuing or taking up the habit, a reversal of RYO prevalence in the long term is more probable. Such an approach could start by intensifying and concentrating what cessation policy we currently have towards RYO users, many of whom we are able to broadly identify demographically. Tax-based policy mechanisms have a strong foothold in the New Zealand (NZ) tobacco cessation strategy aimed at achieving a smoke-free NZ by 2025. Previous price elasticity estimates ignored differences between consumers of loose tobacco and manufactured cigarettes (MC). Price elasticity of demand for Roll-Your-Own (RYO) tobacco consumers is estimated to be −0.441 for the period 1991–2011 and −1.033 for consumers of MC. RYO tobacco is shown to be a substitute for MC and an inferior good. The current non-fiscal cessation policy design is overly general in its approach to smoking. Policy design specific to RYO use should be developed to target this growing user group. We gratefully acknowledge the econometric advice provided by Dr Baiding Hu. Ministry of Health. Tobacco trends 2006: monitoring tobacco use in New Zealand. Wellington: New Zealand Ministry of Health, 2006. Ministry of Health. Tobacco use in New Zealand: key findings from the 2009 New Zealand Tobacco Use Survey. Wellington: New Zealand Ministry of Health, 2010.
. Prevalence and attributes of roll-your-own smokers in the international Tobacco Control (ITC) Four Country Survey. Tob Control 2006;15:iii76–82.
. Prevalence, correlates of, and reasons for using roll-your-own tobacco in a high ryo use country: findings from the ITC New Zealand survey. Nicotine Tob Res 2010;12:1089–98.
. Price increase causes fewer sales of factory-made cigarettes and higher sales of cheaper loose tobacco in Germany. Health Econ 2008;17:683–93.
. Trends in roll-your-own smoking: findings from the ITC four-country survey (2002–2008). J Environ Public Health 2012;2012:406283.
. The demand for tobacco products in Finland. British J Addict 1989;84:1183–92.
. Demand for tobacco in Europe an econometric analysis of 11 countries for the PPACTE project. Helsinki, Finland: National Institute for Health and Welfare. Report 6/2012, 2012. ISBN: 978-952-245-593-2 (printed).
. Is roll-your-own tobacco substitute for manufactured cigarettes: evidence from Ireland? J Public Health Published Online First: 3 Apr 2013. National Tobacco Control Working Group. Smokefree Aotearoa/New Zealand by 2025: next steps 2011–2015. http://www.sfc.org.nz/announcements.php#smokefree2025 (accessed 2 Apr 2012).
. Tobacco taxes as a tobacco control strategy. Tob Control 2012;21:172–80. International Agency for Research on Cancer. IARC Handbooks of cancer prevention: tobacco control. Effectiveness of tax and price policies for tobacco control. World Health Organisation, 2011.
. Tobacco tax as a health protecting policy: a brief review of the New Zealand evidence. NZ Med J 2005;118:105–14.
. What are the elements of the tobacco endgame? Tob Control 2012;21:293–5. Ministry of Health. Excise on tobacco: proposed changes. Wellington, New Zealand: New Zealand Ministry of Health, 2010. http://www.health.govt.nz/about-ministry/legislation-and-regulation/regulatory-impact-statements/excise-tobacco-proposed-changes (accessed 3 Apr 2012). Treasury. Regulatory Impact Statement: increase in tobacco excise and equivalent duties. Wellington, New Zealand: The New Zealand Treasury, 2012. http://www.treasury.govt.nz/publications/informationreleases/ris/pdfs/ris-tsy-iteed-may12.pdf (accessed 4 May 2012).
. Cigarette demand: a meta-analysis of elasticities. Health Econ 2003;12:821–35.
. The demand for cigarettes in New Zealand—an econometric analysis of the effect of increased taxation. In: Tatchell PM, ed. Proceedings of the Second Australian Conference of Health Economists: economics and Health 1980. Canberra: The Australian National University. Health Research project Technical paper 4.
. Impact of cigarette advertising on aggregate demand for cigarettes in New Zealand. Br J Addict 1988;83:409–14. New Zealand Institute of Economic Research. A review of tobacco taxation. In: Tobacco taxation as a health issue. Public Health Commission, 1995.
. Anti-smoking publicity and the demand for tobacco in the U.K. Manch Sch 1973;41:265–82.
. Does advertising affect drinking and smoking? University of Western Australia, 1985 Discussion Paper 85.
. The financial effects of tobacco tax increases on Maori and low-income households. Report for the Smokefree Coalition and Aparangi Auahi Kore. Department of Public Health Wellington School of Medicine, 2000.
. Report on Tobacco Taxation in New Zealand. Report commissioned by The Smokefree Coalition and ASH New Zealand. 2007.
. Price elasticity estimates for tobacco products in India. Health Policy Plann 2008;23:200–9.
. Current manufactured cigarette smoking and roll-your-own cigarette smoking in Thailand: findings from the 2009 Global Adult Tobacco Survey. BMC Public Health 2013;13:277–84.
. A theory of rational addiction. J Polit Econ 1988;96:675–700.
. Rational addiction and the effect of price on consumption. Am Econ Rev 1994;84:396–418.
. The econometrics of rational addiction: the case of cigarettes. J Bus Econ Stat 2001;19:449–54.
. An efficient method of estimating seemingly unrelated regressions and tests for aggregation bias. J Am Stat Assoc 1962;57:348–68.
. The relationship between smoking, quitting smoking and obesity in Australia: a seemingly unrelated probit approach. Appl Econ 2013;45:2191–9.
. The demand for cigarettes in Taiwan: domestic versus imported cigarettes. Contemp Econ Policy 1999;17:223–34.
. Econometric analysis. 6th edn. Upper Saddle River, New Jersey: Pearson Prentice Hall, 2008.
. Illicit tobacco trade: monitoring and mitigating risk in New Zealand. Auckland, New Zealand: Action on Smoking and Health, 2010. Statistics New Zealand. Historical population estimates tables. http://www.stats.govt.nz/browse_for_stats/population/estimates_and_projections/historical-population-tables.aspx (accessed 20 Aug 2012). Quantitative Micro Software. EViews 7 User's Guide II. Quantitative Micro Software, LLC. 4521 Campus Drive, #336, Irvine CA, 92612–2621. 2010.
. Distribution of the estimators for autoregressive time series with a unit root. J Am Stat Assoc 1979;74:427–31.
. Testing for a unit root in time series regression. Biometrika 1988;75:335–46.
. Testing the null hypothesis of stationary against the alternative of a unit root. J Econometrics 1992;54: 159–78.
. Tests of statistical hypotheses concerning several parameters when the number of observations is large. T Am Math Soc 1943;54:426–82.
. Hand-rolled cigarette smoking patterns compared with factory-made cigarette smoking in New Zealand men. BMC Public Health 2009;9:194.
. The roll-your-own cigarette market in Canada: a cross-sectional exploratory study. Tob Induced Dis 2009;5:5. Contributors CS developed the initial concept for the research, provided critique on earlier versions and approved final content. PT is the principal investigator. He worked on all aspects of the study, including concept and design, data analysis, manuscript writing and final approval. PR is a research associate and was responsible for data management and analysis. He wrote sections pertaining mostly to the introduction. All authors contributed to interpretation of the analysis and writing of the manuscript. Funding This work was supported by the New Zealand Health Research Council grant number (11/818). Data sharing statement All data series used are publicly available from Statistics New Zealand.